Click here to purchase Bishop Street or to read other reviews. You’ll need a tissue before you’re through! Brief synopsis: Maggie is one of four former orphans who became a family when they were children at the Bishop Street Orphanage where they endured a hard childhood of abuse and neglect. Deception caused them to separate and they haven’t seen each other in twenty years. Tormented by her own guilt of abandonment, Maggie begins her journey to reunite with her childhood family. Story: I thought the story was creative and well done, especially given the deep subject matters it crosses throughout the book. The author was sensitive and empathetic. There were a couple times when I thought things went a little too easy, but was glad to be spared the heartache that might have come otherwise. The plot continued to make my heart beat as Maggie searched out each of her friends and learned of their own unique stories of how their lives had unfolded. The author uses a colorful prose that makes you feel like you are there with Maggie, especially when traveling to the quaint Midwestern farm town and when searching through the slums of LA. Characters: The characters were well developed and easy to believe. I cared about Maggie and felt her sadness and cheers throughout her emotional roller coaster. I really liked Randolph and his sincerely when it related to Maggie and Damon’s firm hand, which Maggie needs. I appreciated how Elizabeth’s life created a contrast for the four orphan friends through her simple stability, which wasn't so simple. 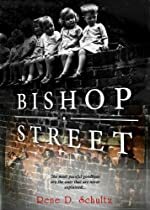 Recommendation: Bishop Street is a heartwarming story that will no doubt make you smile and cry. It would go well with a soothing cappuccino with marshmallows and a cozy blanket. I would definitely recommend this book as a great contemporary fiction packed with deep emotion. p.s. If you like this blog, then please click the +1 button just below here so others can find it, too!